SearchStage.com is the PUP that uses misleading techniques to prevent removal. Use Reimage to locate malicious components and get rid of them faster than with uninstall instructions. A full system scan blocks virus reappearance and prevents traffic to malicious domains. How did you install this browser hijacker? 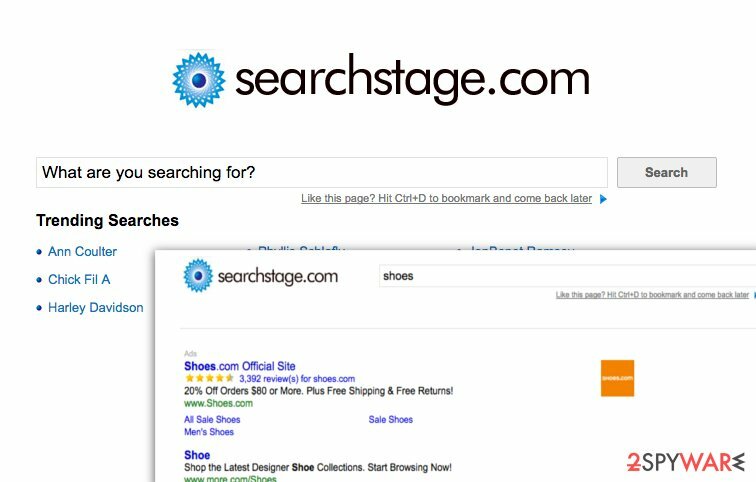 Be careful and if you ever end up visiting a suspicious website after opening one of SearchStage search results, avoid providing your personal information or downloading questionable files. Chances are, you might install harmful programs or fake software updates, so always think before clicking on that “download” button while browsing through suspicious third-party web pages. If you have already experienced redirects that we have mentioned in this article, and if you are looking for SearchStage.com removal instructions, you should scroll down this page. At the end of this post, you can find a comprehensive tutorial explaining how to remove this browser hijacker from the system. Alternatively, you can remove SearchStage.com redirect virus automatically with the Reimage program. If you cannot remember when did you installed this program, it means that it has hijacked your system without your knowledge. However, SearchStage.com hijack typically occurs with user’s intervention. The problem is that the majority of PC users tend to rush when they install new programs, and they often miss important statements suggesting to install additional programs. These offers must be deselected in order to avoid installing PUPs. These proposals can be found in either Custom or Advanced settings. Make sure you do not choose classic Default or Standard ones since they do not provide the opportunity to adjust components of the download. Now that you have learned how to avoid installing potentially unwanted programs, please take a look at the next paragraph to find out how to uninstall this browser hijacker from your system. Before you start SearchStage.com removal procedure, you should know a few things. First of all, this program or its remains can leave your computer vulnerable to malware attacks, and that is why it is crucial to delete all components of it. Second, it is highly advisable to scan your computer system with automatic spyware/malware removal tool to see if you have managed to remove SearchStage.com components successfully. Finally, automatic malware removal tool can help you to eliminate these remains, as well as all other dangerous files from the system. Here, look for SearchStage.com or any other recently installed suspicious programs. Wait until you see Applications folder and look for SearchStage.com or any other suspicious programs on it. Now right click on every of such entries and select Move to Trash. When in the new window, check Delete personal settings and select Reset again to complete SearchStage.com removal. Once these steps are finished, SearchStage.com should be removed from your Microsoft Edge browser. Here, select SearchStage.com and other questionable plugins. Click Remove to delete these entries. Now you will see Reset Firefox to its default state message with Reset Firefox button. Click this button for several times and complete SearchStage.com removal. Here, select SearchStage.com and other malicious plugins and select trash icon to delete these entries. Click Reset to confirm this action and complete SearchStage.com removal. Here, select Extensions and look for SearchStage.com or other suspicious entries. Click on the Uninstall button to get rid each of them. Here, look at the Homepage field. If it was altered by SearchStage.com, remove unwanted link and enter the one that you want to use for your searches. Remember to include the "http://" before typing in the address of the page. Now you will see a detailed dialog window filled with reset options. All of those options are usually checked, but you can specify which of them you want to reset. Click the Reset button to complete SearchStage.com removal process. This entry was posted on 2016-09-06 at 05:33 and is filed under Stealing programs, Viruses. You can quickly scan the QR code with your mobile device and have SearchStage.com virus manual removal instructions right in your pocket. How did you remove SearchStage.com virus?